A unique feature of Indian philosophy is that it is not a product of the speculative intellect as in the West but the intellectual expression of a spiritual experience. Behind every concept of Indian philosophy there is a spiritual experience which can be verified and re-experienced. Many of the concepts and experiences of ancient Indian seers were re-experienced by modern Indian seers and mystics. 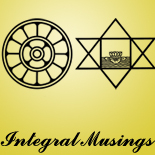 The main objective of this article is to illustrate this principle of Indian philosophy from the experiences of a modern spiritual master, the Mother of Sri Aurobindo Ashram. An interesting concept of tantra philospophy is the concept of Bindu, a spaceless and timeless point which contains the entire universes in seed form and from which the entire creation unfolds in space and time. In the following passage, the Mother talks about one of her inner experiences which gives an indication of the spiritual experience behind the concept. At the mental level the process of imagination can perhaps help us to understand this concept and the experience. Before imagining something, we must have an idea or concept of what we want to imagine. For example, if we want to imagine the vast immensity of space with many worlds in it, first we must have the idea or concept of a vast space and the idea of many worlds. This idea or concept remains first in a mental bindu. Our imagination gives a form to the idea and unfolds it in our mental space. Similarly, using Sri Aurobindo’s terminology, we may say that the universe, before it is unfolded in time and space, exists as a “Real-idea” in a spaceless and timeless Bindu. Sri Aurobindo calls it as a real idea because it is not an abstraction as in our mind but a concrete spiritual reality. The real-idea is a pregnant vibration in the creative consciousness of the Supreme and contains all the principles which constitute a universe. The creative act unfolds this Idea and the principles in space and time and name and form. But in the consciousness of the Spirit nothing is imagination but everything is a Divine vibration in the Divine consciousness taking form in a Divine substance. It moves and it doesn’t move. How can you explain that? It was in motion, a constant, unceasing motion, and yet there was no shifting of place. I had the perception, or rather there was the perception, of something which WAS forever, which never repeated itself, neither began nor ended, which didn’t shift places yet was always in motion. However, to the consciousness it was very, very clear. It was neither mysterious nor incomprehensible, it was absolutely obvious – though untranslatable to our mental consciousness. For they were contradictory, yet they existed simultaneously, indistinguishable: they were not stacked one upon another – it was all simultaneous. How can you explain that? It’s too difficult. It must be experienced. Modern science was able to arrive at some right concepts about the truth of matter, but the scientific mind doesn’t have the corresponding experience. For example, according to quantum physics, the ultimate unit of matter is at once a particle and a wave. If you ask the physicist “What do you mean by wave? Is it a material wave?” he will say, “No, no it is a mathematical wave of probabilities like the crime wave in a city”. But the physicist doesn’t have the experience. He has stumbled upon a deep truth of matter through a sort of intellectual insight but he has not the experience of what he has perceived in his intellect. In the following passage, Mother describes her experience of her body and the material world as a wave, which shows that the “wave” of quantum physics is in fact “a material, corporal wave” and not merely a mathematical abstraction. For instance, I am walking a little now, with someone’s assistance, to get the body used to it again. And when I started walking, I became aware of a rather peculiar state … I might describe it as: what gives me the illusion of a body (Mother laughs) … I entrust it to the person I walk with. In other words, it’s not my responsibility: the other person has to make sure it doesn’t fall, doesn’t bump into anything – you see what I mean. And the consciousness is a limitless consciousness, like a material equivalent or expression of these gusts – it’s like waves, but waves with no … Not separate waves, but a MOVEMENT of waves; a movement of what might be called material, corporeal waves, as vast as the earth, nut not … not round, not flat … Something giving a great sense of infinity but moving in waves. And this wave movement is the movement of life. And the consciousness (the body-consciousness, I suppose) floats along in this, with a sensation of eternal peace … But it’s not an expanse – that’s not the word for it. It is a limitless movement, with a very harmonious and very tranquil rhythm, very vast, very calm. And this movement is life itself. I walk around the room, and that is what is walking. The Mother’s Yoga, A compilation from Mother’s Agenda, Vol.1&2, published from Auroville, Puducherry. This entry was posted on February 4, 2014 by integralmusings in Religion, Spirituality & Philosophy.